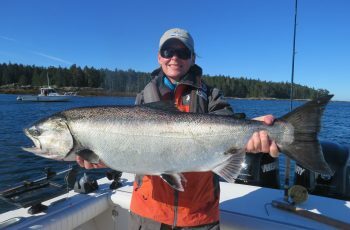 Fishing continues here at Langara, a spotty trip which included four tyee, two fish at 40 lbs. 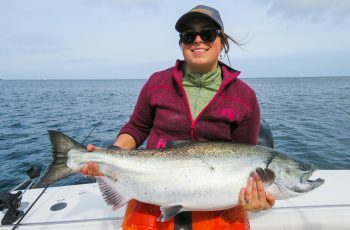 Overall a tougher fishing week in here, but the good news is some fish moved into the east side of Langara today, with Boulder Bay and Cohoe Andrews producing. I personally had a tough go at it, could not get on em.We fished Shag Rock to Green Point, notta, spent lots of time out in the deep, with limited success. Lots of bait out there for a few weeks, but now the feed seems to have moved out. Flat calm conditions today, with a heavy mist and fog, 9 C. decent conditions, but no fish at Lacy. Talked to a troller friend of mine working out in the deep and he told me a dozen fish a day was all they were taking, very slow. Boulder Gunia was holding some fish, along with heaps of pinks. A couple hours trolling was producing a couple springs a boat. one decent fish , a 43 was hit by another lodge in there this afternoon. Andrews lit up for Jacks in the pm, we easily put the boots to Five of them and trolled up a 28 lb halibut for Russ Samples. We fished deep, to avoid the pinks, thanks Scotty! 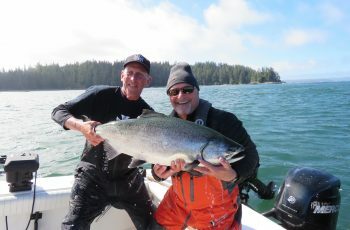 The Reef did not produce today, but did produce a 40 lb chinook yesterday in Predator 2. Boat 6 had a couple tyee here as well this trip. 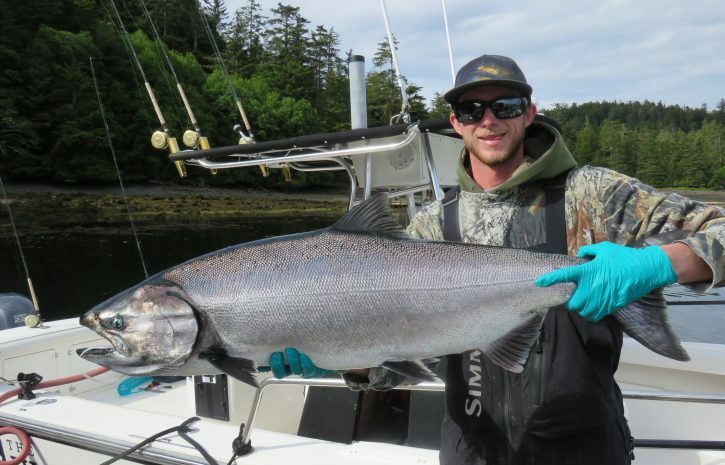 Another 40 came from Andrews yesterday in the am on one of the self guided boats. 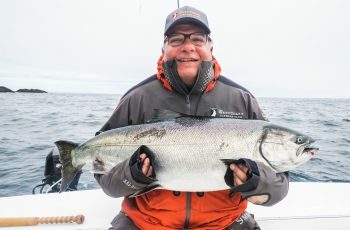 Steven Baur had a 40 lb chinook, Frank Cross had a 40 lb chinook, Gary Hayden released a couple nice tyees with Kory, thanks to Gary for making this effort. Gary had four fish in the twenties to take home for the table. As stated a tough week for the salmon, but signs are pointing to another run starting to seep in here. That said two at 40 lbs, not to shabby. 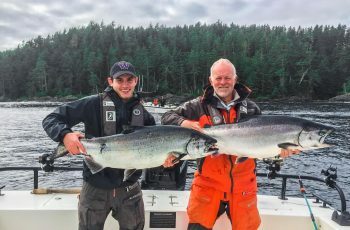 That is why the Langara area is the top chinook fishery we have here on the coast, for five months of the year 40 lb fish are produced year after year! Halibut continues strong when weather permits, too many to talk about, lots of hali around 50 for the table, those big boys are nice to release! Nice to discuss this before heading out, easy to get caught up in a club fest. Ideally all halibut over the century mark are nice to set free, as most of you know by now, they are our breeding stock! Thanks to all those who practice this.